No traffic jams, no big smoke, no high rises. 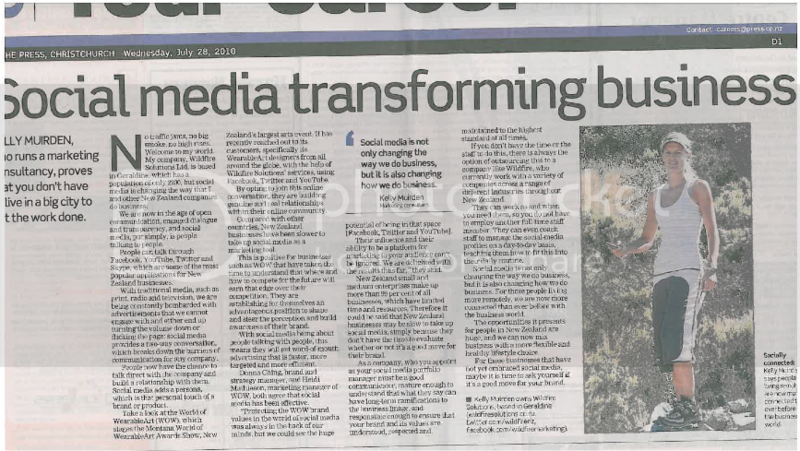 My company, Wildfire Solutions Ltd, is based in Geraldine, which has a population of just 2200, but social media is changing the way that I and other New Zealand companies do business. We are now in the age of open communication, engaged dialogue, transparency and social media, put simply, is people talking to people. People can talk through Facebook, YouTube, Twitter and Skype, which are some of the most popular applications for New Zealand businesses. With traditional media, such as print, radio and TV, we are being constantly bombarded with advertisements that we cannot engage with and either end up turning the volume down or flicking the page: social media provides a two-way conversation, which breaks down the barriers of communication for any company. People now have the opportunity to talk direct with the company and build a relationship with them. Social media adds a persona, which is that personal touch of a brand or product. Take a look at The World Of WearableArt, which stages the Montana WOW Awards Show, New Zealand’s single largest arts event. They have recently reached out to their customers, specifically their WearableArt designers from all around the globe, with the help of Wildfire Solutions’ services using Facebook, Twitter and YouTube. By opting to join into this online conversation, they are building genuine and real relationships within their online community. Compared to other countries, New Zealand businesses have been slower to take up social media as a marketing tool. This is positive for those businesses like WOW that have taken the time to understand that where and how to compete for the future will earn that edge over their competition. They are establishing for themselves an advantageous position to shape and steer the perception and build awareness of their brand. With social media being about people talking with people, this means that they will get word of mouth advertising that is faster, more targeted and more efficient than ever before. Donna Ching, brand and strategy manager, and Heidi Mathieson, marketing manager of WOW both agree that social media marketing has been effective. “Protecting the WOW brand values in the world of social media was always in the back of our minds but we could see the huge potential of being in that space (Facebook, Twitter and YouTube). Their influence and their ability to be a platform for marketing to your audience can’t be ignored. We are delighted with the results thus far,” they said. New Zealand SME’s make up more than 99 per cent of all businesses, which have limited time and resources, therefore it could be said that New Zealand businesses may be slow to take up social media, simply because they don’t have the time to evaluate whether or not it’s a good move for their brand. As a company, who you appoint as your social media portfolio manager must be a good communicator, mature enough to understand that what they say can have long term ramifications to the business image, and responsible enough to ensure that your brand and its values are understood, respected and maintained to the highest standard at all times. If you don’t have the time, or the staff to do this, then there is always the option of outsourcing this to a company like Wildfire, who currently work with a variety of companies across a range of different industries throughout New Zealand. They can work as and when you need them, so you do not have to employ another full-time staff member. They can even coach your staff to efficiently manage the social media profiles on a day-to-day basis, teaching them how to fit this into their current daily routine. Social media is not only changing the way we do business, it is also changing how we do business. For those people living more remotely, we are now more connected than ever before with the business world. The opportunities it presents itself for people in New Zealand are huge and we now have the opportunity to mix business with a more flexible and healthy lifestyle choice. For those businesses that have not yet embraced social media, maybe it is time to ask yourself if it’s a good move for your brand.